To recreate the best in chryselephantine sculptures, we only use the best, grade "A", Siberian mammoth ivory from Russia which are perfectly preserved. All of our sculptures are legal to own, buy, sell and ship within the United States and abroad. 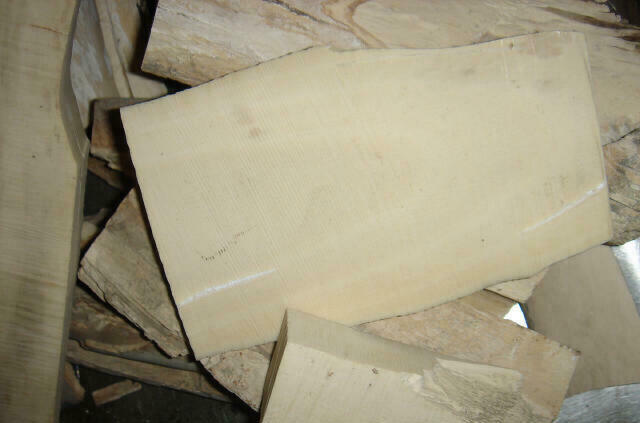 The use of mammoth ivory totally complies with C.I.T.E.S., U. S. Fish & Wildlife Service as explained in the articles below. There is no lost in quality using mammoth ivory vs. pre-ban elephant ivory. 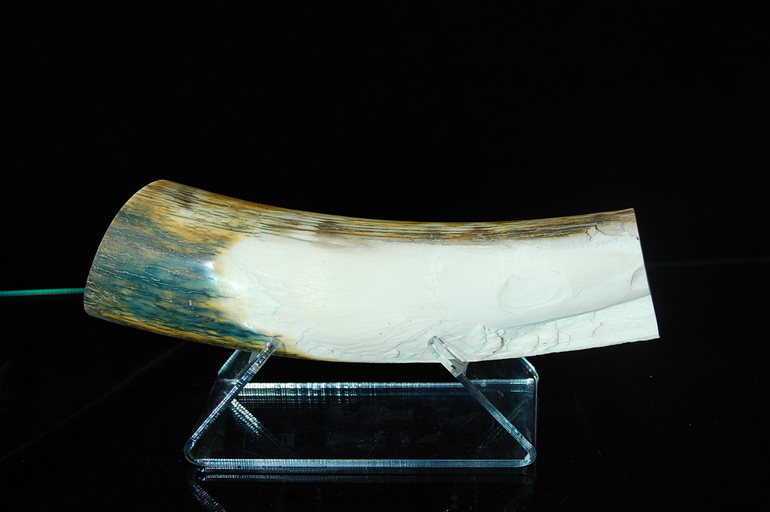 Mammoth ivory ages like wine...it richly matures and becomes more appealing in the antique sense. By using mammoth ivory we all discourage the inhumane poaching of living elephants around the world. What is so Special in Mammoth Ivory? The fresh arrival of newly excavated Mammoth Ivory comes directly into the United States through a handful of main American seaports. One of these rarely importing Mammoth Ivory ports is currently the most highly guarded Los Angeles, California shipping port through this specific West Coast shipping port, only the best legally prided works of legitimate Mammoth Ivory pieces will be allowed through. The excavation of the Woolly Mammoth that is legally dug up nowadays comes in a handful of grading, along with specified ivory categories. There is the Grade A complete tusks, of different weights and shapes; there is the Bark ivory, and Mammoth tusk pieces of variable sizes as well to choose from. There is nothing like, the 10,000 year old extinct mammoth ivory pieces that rare and hard found just keep growing to be a bigger business than that of ever before in the legal ivory trading companies of even the near past. The ivory of the Woolly Mammoth has never truly been a rare choice for necessity and even artworks, but the extinct Woolly Mammoth looked for more that ever after today is now personally and financially more desired than that of ever before in the world of natural material art crafting works. There are even still several forms of fresh Mammoth Ivory arrivals that most always seem to never be able to not make the grade of professional artist approval. The fresh arrival of newly excavated Mammoth Ivory comes directly into the United States through a handful of main American seaports. One of these rarely importing Mammoth Ivory ports is currently the most highly guarded Los Angeles, California shipping port through this specific West Coast shipping port, only the best legally prided works of legitimate Mammoth Ivory pieces will be allowed through. This process of legalization formation has been proven over and over to safe and efficient in the final ivory shipping trades that are officially finalized. The excavation of the Woolly Mammoth that is legally dug up nowadays comes in a handful of grading, along with specified ivory categories. There is the Grade A complete tusks, of different weights and shapes; there is the Bark ivory, and Mammoth tusk pieces of variable sizes as well to choose from. The two main continents so far that tends to support the Woolly Mammoth Ivory Trade are the state of Alaska and the country of Siberia. Although, many anthropologists so far agree on most all Mammoth Ivory to be the average age of approximately 10,000 years old, it is not so uncommon for there to be a somewhat common age of Mammoth Ivory currently excavated deep in Alaska to be approximately 50,000 years old. No matter what exactly that you are looking for as a collective distributor or as a private artist that chooses to only work with the best ivory that can be found, there are several very reputable distributors to ultimately choose from in mammoth ivory collections. There are full Mammoth Ivory Tusks to the smallest of pieces that you are able to choose from, and every shape, thinness, and thickness in between. NOVY URENGOI, Russia: As Viktor Seliverstov works in his makeshift studio in this hardscrabble Siberian town he is enveloped in a cloud of ivory dust. His electric carving tool whirrs over the milky surface of teeth and tusks, as he whittles them into key fobs, knife handles and scrimshaw figurines. But these are not whale bones or walrus tusks he is working on. The ivory in this part of the world comes from the remains of extinct woolly mammoths, as they emerge from the tundra where they have been frozen for thousands of years. It is a traditional Russian business that had all but gone extinct itself during the Soviet period but is flourishing now. "A lot of people find ivory and don't know what to do with it," Seliverstov said of the residents of this town, where more than a few closets and old barns have a tusk or two in them. Seliverstov recently paid $500 for about seven kilograms, or 16 pounds, of mammoth ivory from a family that had stashed it in a barn for years before realizing its value. The trade, bolstered recently by global warming, which has melted the tundra and exposed more frozen remains, is not only legal but actually endorsed by conservationists. They note somewhat grudgingly that while the survival of elephants may be in question, it is already too late for mammoths. Mammoth ivory from Siberia, they say, meets some of the Asian demand for illegal elephant ivory and its trade should be encouraged. While Ice Age ivory has been carved in Siberia since the 17th century, it was further helped by the international ban on the elephant ivory trade in the late 1980s. Russian exports of mammoth ivory - the only type of ivory legally imported into the United States - reached 40 tons last year, up from just 2 tons in 1989, said Aleksei Tikhonov, director of the Zoological Museum in St. Petersburg and an expert on mammoths. While prices vary, leading dealers in Moscow usually ask $300 to $400 a kilogram for average grade ivory. By the time it reaches Western markets, the same ivory can sell for as much as $1,600 a kilogram, dealers say. The sources are varied, though reindeer herders, oil and gas workers, and professional ivory hunters provide the bulk of the supply. "They gather tusks like mushrooms after the rain, literally," Tikhonov said. While mammoth tusks may not be as valuable as Russia's deposits of oil and natural gas, they are almost as plentiful. The Siberian permafrost blankets millions of square kilometers, ranging in depth from a meter to more than a kilometer and resembling frozen spinach. Hidden in one of the upper layers of this mass, corresponding to the Pleistocene epoch, are the remains of an estimated 150 million mammoths. Some are frozen whole, as if in suspended animation, others in bits and pieces of bone, tusk, tissue and wool. Woolly mammoths are the last of three extinct elephantine species that inhabited Siberia. They appeared about 400,000 years ago and lasted at least until 3,600 years ago - the age of some mammoth remains found on an island off the northern coast of the Russian region of Chukotka in 1993. That is another point in favor of the mammoth ivory trade, said Tikhonov, the Russian mammoth expert. It encourages the gathering of tusks that would otherwise be lost. In fact, he said, vastly more mammoth ivory is destroyed in this natural cycle in Russia than is ever found and sold, perhaps hundreds of tons a year. Gary Haynes, a paleoanthropologist at the University of Nevada at Reno, said he could not help but cringe at seeing the tusks destroyed. The growth rings and possible prehistoric human butcher marks contain a wealth of data on the ancient climate and peoples of Siberia that could shed light on, among other things, the debate over whether climate change or over-hunting, or both, felled the mammoths. "There's a kind of discomfort when you're a scientist and you see something that could have scientific value being carved up and destroyed," Haynes said. "But this is the trade-off," he added. "I see the businessman's arguments, too. Mammoths are already extinct and people need an economy." In addition, the Russian government examines the tusks to make sure none bearing disease, prehistoric human markings or other scientifically valuable elements are exported. About 90 percent of the Siberian ivory is exported to Asia, where it is principally used in the manufacture of personal seals that in Japan, China and Korea are used in place of signatures for business transactions. These seals support much of the Siberian industry. While tusks are plentiful on the surface, whole frozen mammoths are not. They are also not exported. When a Nenets herdsman discovered a frozen calf on the Yamal Peninsula last May, the mammoth, named Lyuba, was kept in a freezer in Tikhonov's museum in St. Petersburg, where scientists are sampling its tissue for an ongoing scientific effort to sequence the mammoth genome. Tikhonov dismissed cloning as improbable, though gene splicing could be used to add mammoth characteristics to Asian elephants, he said. Seliverstov, the ivory carver, said he had no compunctions about working with a prehistoric resource. "People will treasure my art for generations," he said. "I give the mammoths a second life."